Inspired from the texture and grain in granite and stone, this Marbled Lokta Origami Paper features veins of metallic gold, silver and copper flowing against the handmade Papaya orange Lokta origami paper. Both the paper and the marbling are crafted by hand by paper artisans in Nepal. Inspired from the veins of texture in granite and stone, this Marbled Lokta Origami Paper takes natural designs to a whole new level with bright and metallic colors. Intricate marbled patterns in glittering gold, silver and copper flow across each orange-colored sheet creating a one-of-a-kind design on each and every sheet. Lokta Paper is a strong, durable and eco-friendly paper hand made from the fiber of the "Nepal Paper Plant," also called the Daphne Shrub or Lokta Bush. The pulp fibers are long and flexible providing exceptional strength while maintaining its light weight. This paper features subtle fiber inclusions, adding natural beauty to whatever you create with it. 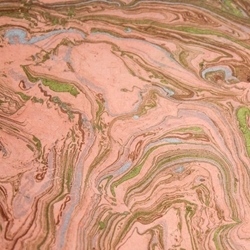 On the handmade base sheet, vibrant metallic colors flow over the entire page creating a beautiful marble pattern. Use this paper as a “blank canvas” for art applications and paper crafts.